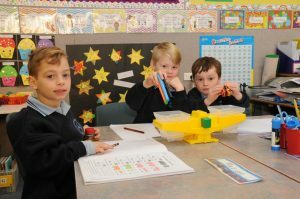 At St Peter Julian Eymard Mooroolbark we teach mathematics to equip children with the knowledge, skills and understandings they require to engage effectively in the world around them. We aim to foster mathematical thinking that empowers students to reason, problem solve and explore mathematical concepts, in order to be able to apply them successfully in a variety of situations. The Victorian Curriculum is the basis for the mathematics curriculum at St Peter Julian Eymard School. Children learn the essential mathematical skills and knowledge they will need in the areas of Number and Algebra, Measurement and Geometry and Statistics and Probability. Our mathematics curriculum provides students with access to important mathematical ideas, knowledge and skills that they will draw on for many years to come in both their personal and work lives. In our mathematics classrooms, children are provided with regular opportunities to work together and share their ideas, understandings and expertise. Lessons include the use of a range of different tools to engage children in their learning and enhance their understandings. Through the use of a wide variety of differentiated and open-ended tasks, children are challenged to further develop their skills while working at their own level. Children are provided with engaging, hands on activities that aim to develop their mathematical understandings in meaningful and relevant ways. Activities are designed to help students gain confidence and enjoy mathematics as they learn new concepts and practice new skills.